What Else Can I Expect From an Online Master's in Communication Program? Communications, a multidisciplinary field of study that explores the various methods of private and professional human interaction, includes elements of oral and written language, history, sociology, anthropology, psychology, and statistics. Due to the recent rise in digital communication, the field also incorporates information technology and computer science. According to PayScale, those who earn a master's degree in communication earn a median annual salary of $59,500 during their first four years on the job and $67,500 after 10 years in the workforce. Master's in communication jobs exist in industries such as business administration, education, law, technology, and journalism. Many learners choose to build on their undergraduate studies by earning a master's in communication, as well. In recent years, communication has grown in popularity among graduate-level students. The curriculum of a master's in communication degree program typically includes advanced coursework in mass media, public relations, writing, marketing, and information technology. Some programs also allow you to earn specializations in niche areas of the field. Many students today earn their master's in communication online, rather than in a classroom. Online programs usually adhere to the same curricula as their brick-and-mortar counterparts, and may also be more suitable for students that cannot commit to full-time, on-campus studies. With our comprehensive guide, read on to learn more about what you can do with an online master's in communication and the career opportunities that await you. Learn more about what you can do with an online master's in communication and what kind of career opportunities you can look forward to with this comprehensive guide. 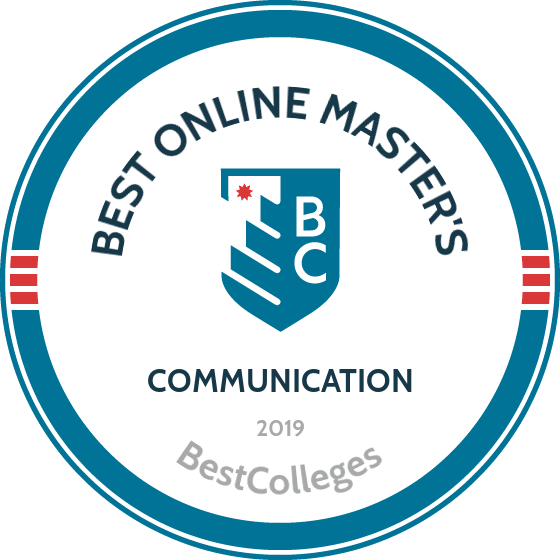 The best master's in communication degree online programs introduce advanced theories and methods in communication, allowing students to follow specialized learning tracks related to their career of choice. While a bachelor's degree is generally considered the minimum attainment level for most communications careers, a master's in this field can help graduates land managerial or top-level roles. A master's can also lead to advancement opportunities in the degree-holder's current organization. Some online communications master's programs prefer or require candidates to possess at least one or two years of professional experience before enrolling. In most cases, however, applicants will only need a bachelor's degree to apply. Scores from the GRE, GMAT, or other standardized entrance exams may also be needed, although a growing number of schools no longer require this component. There are a handful of important considerations to make when choosing an online communications master's program. These include the overall cost (tuition and added expenses), institutional data such as student retention and graduation rates, and the school's accreditation status and reputation. Many students also choose colleges and universities based on unique courses, specializations, and internship possibilities. What are the Advantages to Earning My Master's in Communication Online? Online communication master's programs follow the same curricula as brick-and-mortar pathways, so successful graduates often qualify for the same post-degree job opportunities. Without the need to make regular trips to and from campus, the asynchronous (or self-paced) format of many online master's in communications degree programs offers an ideal alternative to students who work full time or care for small children. Located in Baltimore, Maryland, Johns Hopkins University was founded in 1876. Currently, the university boasts 27 current and former students and faculty holding Nobel Prizes, including President Woodrow Wilson. Today's faculty includes three Nobel laureates, six MacArthur fellows, and one Pulitzer Prize winner. Notable alumni include film director Wes Craven, former Mayor Michael R. Bloomberg, biologist Rachel Carson, and ex-NAACP President Kweisi Mfume. The school offers an online master's in communication that addresses digital and written communications for practical applications. Students learn to assess and perform research to solve field problems and improve message delivery. This degree offers six concentrations: applied research in communication, public and media relations, political communication, digital communication, health communication, and corporate/nonprofit communication. Learners also choose between strategic planning and research tracks. Only the research track mandates a thesis. Degree-seekers complete 10 classes, with offerings including introduction to the digital age, theory of mass communication practices, multimedia authoring, advanced social media management, crisis communication, managerial communication, and communication evaluation. Students must complete the program within five years, though most complete their degrees in two. Students can pursue dual degrees with a master's in communication and master's in business administration. Combined, these degrees require 31 classes. Degree candidates can also take four additional courses to earn a certificate in nonprofit management with their communication master's. Johns Hopkins' Center for Communication Programs oversees over 60 programs that encourage healthy communities through advocacy and communication. Students nearing graduation can consider the center's career opportunities for field employment. Johns Hopkins University is accredited by the Middle States Commission on Higher Education (MSCHE). UF's history reaches back to 1858, when James Henry Roper started the Gainesville Academy. This public institution currently boasts a 96% beginning freshman retention rate, and two faculty members with Pulitzer Prizes. UF's College of Journalism and Communications offers online communication master's degrees in eight specializations: audience analytics, political communication, digital strategy, public interest communication, global strategic communication, web design and online communication, public relations and communication management, and social media. The department provides an online quiz to help students determine which specialization fits their needs. These focuses require different courses and credit loads. The social media specialization calls for 38 credits, including mass communication theory and introduction to multimedia. The global strategic communication focus requires 37 credits in classes such as global activism and public affairs communication. No specialization requires more than 39 credits. Each specialization offers recorded lectures. However, some focuses, including social media and digital strategy, also involve synchronous attendance. Learners may complete these degrees in less than two years, and can also pursue certificates in global strategic communication, media sales, social media, and web design. UF offers a Counseling and Wellness Center, where students can obtain crisis assistance and attend workshops. Online learners can also access library materials, such as ebooks and articles. The Career Connections Center also delivers workshops, along with online career events, mock interviews, and appointments for career guidance. UF holds accreditation from the Southern Association of Colleges and Schools Commission on Colleges (SACSCOC). Originally called King's College, CU was founded in 1754. The name changed to CU in 1896. Today, the institution educates more than 33,000 learners. Students can earn an online master's in strategic communication, which blends traditional and modern communication concepts. This executive master of science requires 36 credits in courses such as strategic communication management, the compelling communicator, principles in persuasion, the reflective leader, and communication research and insights. The program also mandates elective coursework, but permits students to choose classes from other disciplines. This allows learners to personalize degrees to match their career goals. Degree-seekers must also complete a capstone project that proposes an answer for a communication dilemma. Learners may complete CU's communication program in 16 months, but they must attend a number of on-campus weekend events. Students must also complete independent and group assignments, and hold a 3.0 GPA to graduate. Students with less than six years of related experience should apply to the regular master of science in strategic communication instead of the executive option. The department does not allow students to transfer credits into either degree program. However, candidates with prior credits can contact the Office of Student Affairs to earn course waivers. Candidates with seven years of related experience may participate in "Strategic Communication: International Perspectives." Professionals in this program spend one week examining communication topics such as crisis communication, media relations, and corporate communication. CU is regionally accredited by the Middle States Commission on Higher Education (MSCHE). The University of North Carolina opened in opened in 1795 as the original public university in the U.S. Nearly 30,000 students attend this institution, which boasts more than 329,000 alumni from 165 nations. U.S. News and World Report ranked the institution among the top five public universities in the country. The university's School of Media and Journalism offers a master of arts in digital communication, which targets professionals seeking advancement into leadership and managerial positions. This program requires 30 credits in courses such as writing for digital media, information visualization, strategic communication, and media law for the digital age. Candidates also complete a thesis under the guidance of a faculty member. This thesis involves writing and presenting research findings on a topic related to an organization's digital communication problems. The department delivers coursework asynchronously so learners don't need to attend classes at set times. However, some classes may include virtual meetings, which students can attend live or view afterward. Class format also involves cohorts, in which students progress through their courses as a group. UNC Chapel Hill only offers its online master's in communication on a part-time basis. The department only admits 20 learners each fall, and each student must hold at least three years of experience. Candidates complete this program in 2.5 years, and must fulfill two in-person components. Specifically, learners must attend an on-campus orientation and complete a one-week, in-person experience that involves an audio/visual project. After graduating, candidates can pursue a related doctorate at the university. UNC Chapel Hill is regionally accredited by the Southern Association of Colleges and Schools Commission on Colleges (SACSCOC). Northeastern University in Boston, Massachusetts began in 1898 and currently offers courses at its campuses in North Carolina, Washington, California, and Canada. Students can enter programs from the institution's nine schools and colleges, including more than 60 online options. Learners interested in online communication master's programs can apply to the College of Professional Studies' master of science in corporate and organizational communication. This degree focuses on ways to assist businesses through improved communication. The department offers eight concentrations: leading communication strategy and development, cross-cultural communication, leadership, project management, usability/user experience, human resource management, public relations, and social media and online communities. Program classes explore general communication concepts, along with media and organization. Students complete electives in classes such as personal branding, crisis communication, and negotiation. Degree-seekers also complete a capstone project, which addresses company communication. Learners can finish the degree in two or three years. However, the department offers accelerated learning paths for candidates with certain credentials from the Society for Human Resource Management or the Human Resource Certification Institute. Master's students can pursue graduate certificates in social media and online communities, and also public and media relations. These certificates take one to two years. Northeastern also offers master's degrees in technical communication and digital media. Program graduates have gained employment at notable institutions, including Harvard University, MIT, and Boston Globe Media. In fact, the school's global network connects students to over 3,000 possible employers. In 1880, USC welcomed its first class of 53 learners. For the 2018-19 school year, this private school in Los Angeles educated more than 47,000 students. USC also conferred more than 15,000 degrees in June 2018. The U.S. News and World Report ranked this institution as No. 22 among national universities. The institution's Annenberg School for Communication and Journalism offers a 32-credit master's in communication management. This degree targets field professionals and candidates who are entering the field. Students learn to create communication plans that tend to company needs, and then assess the impact of each tactic. To prepare for these tasks, learners explore the psychology of message interpretation and methods for applying research to communication strategies. The program also addresses global aspects of business communication and ways to adapt organizational plans when confronted with change. Students complete eight classes, including uses of communication research, integrated marketing communication strategies, communication in work settings, audience analysis, and strategic corporate communication. Candidates must also complete and orally defend a practicum project that relates to their focus. These classes and experiences introduce learners to communication concepts and tools to excel as management consultants, market researchers, and advertising and public relations specialists. Full-time learners take two courses each term, and graduate with their online master's in communication in 16 months. USC is accredited by the Western Association of Schools and Colleges (WASC). In 1893, Congress chartered AU after Methodist bishop, John Fletcher Hurst, envisioned a school for preparing students for community assistance. The school currently boasts more than 12,000 students, and status among the U.S. News and World Report's top national universities. Degree-seekers can earn an online strategic communication master's that focuses on political and global communication. The school's location in Washington, D.C., strengthens its political focus. Teachers and speakers at AU can boast experience in government, global communication, and advocacy from careers as public diplomacy experts and press secretaries. Students can choose a concentration in advocacy and social impact for a stronger focus on these elements. The general degree requires 30 credits in courses that address writing, research, and ethics for strategic communication. Students can also explore social media and methods to use platforms for political and communication goals. Learners also complete a capstone, in which they find a resolution for an unsolved communication dilemma. Candidates can complete this degree in 20 months. Ninety-five percent of graduates from the School of Communication boast employment or enrollment in graduate programs within six months of graduating. Possible employers include Microsoft, the American Public Health Association, and the U.S. Department of State. The departments allows six transfer credits. Students can also earn the Online Merit Scholarship for as much as $10,000. AU is regionally accredited by the Middle States Commission on Higher Education (MSCHE). Abraham Lincoln signed the Morrill Land Grant Act, which established Purdue University in 1869. This Indiana public school ranks on U.S. News and World Report's lists for top public schools and innovative institutions in the country. The Brian Lamb School of Communication delivers an online master's in communication, targeting field professionals. These candidates explore communication on community and worldwide levels, and find solutions to company dilemmas. Students build writing skills for public relations, explore effective brand development, and learn to foster online and in-person relationships. The program requires 30 credits in fully online classes. Degree-seekers can choose from two concentrations: strategic communication and public relations, and integrated communication and advertising. Each focus requires its own set of coursework. For instance, students earning an integrated marketing communications master's online must take persuasive communication, while strategic communication students take strategic public relations. The department also permits students to create personalized degrees through electives. Candidates complete this program in 20 months. Of program alumni, 92% indicate satisfaction with their degrees, and 86% work full-time. Current students have opportunities to network with alumni who work at companies like Coca-Cola, UNICEF, and the NCAA. Interested learners can attend virtual open houses for insights on Purdue and its communication program. Online students also benefit from library access, virtual communication with advisers, and the Purdue Online Writing Lab (OWL). Purdue OWL, in particular, gives guidance on citation, grammar, and career preparations. Purdue is regionally accredited by the Higher Learning Commission (HLC). UI at Urbana-Champaign began as the Illinois Industrial University in 1867, after Lincoln endorsed the Morrill Act. The school's name changed in 1885, and today more than 45,000 undergraduate and graduate students study at this institution. UI boasts 23 alumni and two faculty with Pulitzer Prizes. The school also ranks among U.S. News and World Report's top public and national universities for 2018-19. The school's 32-credit online master's in communication comes from two departments: the Department of Business Administration and the Charles H. Sandage Department of Advertising. The degree combines concepts from the College of Business and the College of Media to prepare students for business communication tasks. Specifically, the program focuses strongly on brand development, management, and delivery, and explores leadership concepts to help field professionals enter management positions. Candidates also study emerging technologies and social media platforms, and learn to use these tools for company growth. Coursework for this master of science in strategic brand communication addresses business management, promotional strategy, and strategic brand communication essentials, and includes a capstone project. Students can complete all of these classes online in 15 months. Candidates can also pursue certificates in media and analytics, insights, and essentials, or customize a certificate. Each certificate requires three online classes. Online students gain access to library resources, including online journals and reference collections. Candidates also benefit from various study abroad opportunities, including direct enroll programs to Greece, France, Spain, Italy, Belgium, Israel, Australia, and the United Kingdom. UI is regionally accredited by the Higher Learning Commission. Opening in 1972, FIU admitted more than 17,000 students for the 2018-19 school year. This public Miami institution in Miami prioritizes research and boasts status as one of the U.S. News and World Report's 100 best public universities in the country. FIU delivers a master's in global strategic communications, which focuses on international business with an emphasis on management and digital aspects of communication. Coursework addresses branding, conflict, ethics, and media to train learners to excel in advertising and public relations positions for government agencies and companies. Students complete 30 credits in eight-week courses. Possible classes include applied research methods in the mass media, theories of mass communication, global strategic communication management, and global reputation management. Learners can also complete an independent study, through which they explore a specialized topic with faculty guidance. Degree-seekers must complete a research project related to strategic communication, but can graduate in one year. Learners can also obtain a graduate certificate in conflict resolution and consensus building to develop problem-solving skills. Online students can access online library materials, such as ebooks and online articles. Learners may also download free copies of Microsoft Office and McAfee Livesafe, and explore tutorials on communication, study habits, and plagiarism-free research. FIU is regionally accredited by the Southern Association of Colleges and Schools Commission on Colleges (SACSCOC). DU began in 1864 as the Colorado Seminary. This private, nonprofit university boasts distinguished alumni in business, athletics, education, and theater, and also status as one of U.S. News and World Report's top 100 universities. The school's master's in communication management trains degree-seekers to deliver clear, effective ideas through written and oral means. This process involves considering communication channels and audience demographics to determine how others may interpret messages. Candidates also learn to construct plans to solve communication dilemmas. Students pursuing an online master's in communication from DU can choose from six concentrations: dispute resolution, leadership communication, marketing communication, organizational development, public relations, and learning and development. All specializations require 48 credits in 10-week classes, which include business fundamentals for communicators and applied critical thinking in communication. Learners in all concentrations must complete a capstone or portfolio project, and can complete the program in 1.5 years. Candidates can also pursue certificates requiring four or six courses, and 6-12 months of study. The department delivers coursework asynchronously, using Canvas technology. Learners can communicate with other students in live discussions to build networking connections. DU offers alumni career assistance, such as resume guidance, tips for earning higher salaries, and help deciding on professional options. Graduates also benefit from communities such as Pioneer Careers and the University Career Action Network, which connect alumni with jobs and internships. Gonzaga University in Spokane, Washington began in 1887. This Roman Catholic institution follows the Jesuit tradition, and boasts seven colleges and schools. Total enrollment for 2018-19 surpassed 7,500 learners, including 1,601 master's students. These learners benefit from a 12:1 student-to-faculty ratio. Gonzaga alumni include actor Bing Crosby, former Speaker of the House of Representatives Thomas Foley, Senator Catherine Cortez Masto, and three state Supreme Court justices. The institution's master's in communication and leadership equips students to construct communication plans that reflect the intended audience and available data. Students explore methods for dealing with conflict, cultural aspects of communication, and techniques for organizing and delivering ideas. This degree requires 30 credits of coursework in theorizing communication and master's-level writing. Students must also complete a research course and a final thesis or capstone project. The department offers six concentrations: change leadership, college teaching, digital media strategies, global leadership, servant leadership, and strategic and organizational communication. However, students do not need to pursue a concentration. Candidates must fulfill one, three-day on-campus experience to earn this online master's in communication. Online students can also explore study abroad opportunities in Italy, Colombia, Belgium, and the Czech Republic, along with on-campus domestic immersions on leadership and organization. The department allows degree-seekers to transfer up to one-fifth of their required credits, provided they earned a "B" grade or higher in transferred courses. The program prepares candidates to work as consultants, public relations specialists, writers, and managers, with graduates earning positions with companies such as Google, Twitter, Microsoft, and United Airlines. Gonzaga holds accreditation from the Northwest Commission on Colleges and Schools. Located in East Lansing, MSU started in 1855 as the Agricultural College of the State of Michigan. This public institution officially became MSU in 1964 and now offers over 200 programs. The school boasts more than half a million living alumni, 17 degree-granting colleges, and status as U.S. News & World Report's 35th best national public university. As of Fall 2018, more than 50,000 learners from over 140 countries studied at MSU. The school offers an online master's in strategic communication that prepares field professionals to advance into leadership positions. Specifically, the program equips learners to create communication plans and campaigns for digital media. Candidates also explore how to research for marketing purposes. Students complete nine courses, such as digital media strategies, crisis communication, strategic message development, and professional communication ethics. The department also requires a capstone course. Learners can choose from tracks that take 1-3 years, but they must complete all degree components in five years. MSU offers similar master's degrees in journalism, advertising, and media and information. Candidates can also pursue certificates in digital media, media analytics, and leadership and organization. Each certificate requires three courses. The College of Communication Arts and Sciences provides internship opportunities in advertising and public relations, communication, journalism, and media and information. Online students can access library resources, such as electronic journals and newspapers. The library also provides tutorials and resources that help students prepare for research papers. MSU holds accreditation through the Higher Learning Commission. MC started in 1826, making the institution the oldest higher learning organization in the state. Based in the city of Clinton, this private university educates more than 5,000 learners and boasts connections to the Mississippi Baptist Convention. Students interested in focused communication degrees, such as an online strategic communication master's or a master's in visual communication online, should consider MC due to the number of offered degrees. Specifically, online learners can choose a master's in generalist integrated communication, professional communication in health services administration, or professional communication in sports. On-campus students can also pursue a master's in journalism or public relations. All of these degrees require 31 credits and involve core classes, such as communication research, persuasion, and a written comprehensive exam. Degree-seekers may additionally complete field studies as program electives and construct a thesis. Online courses use Moodle technology that allows learners to complete quizzes and discuss course content with professors and peers. Candidates can also pursue a graduate certificate in public relations, which requires 18 credits in classes such as negotiation, intercultural communication, and public relations writing. Students in the Communication Department may participate in internships. In particular, communication learners can pursue internships in Washington, D.C. for the spring and fall terms. MC's Leland Speed Library connects online learners to eBooks, journal articles, and videos for research purposes. Candidates can also use the school's career services for guidance on crafting resumes, choosing a professional wardrobe, and selecting careers related to majors. MC boasts accreditation through the Southern Association of Colleges and Schools Commission on Colleges. The Sisters of Loretto founded Webster University in 1915. This private institution in Missouri caters to military personnel by participating in the Yellow Ribbon Program and allowing servicemen to withdraw if their orders require relocation. Webster offers master's degrees in four communication fields: public relations, media communications, communications management, and advertising and marketing communications. These programs equip learners with expertise in theory and digital media for writing, advertising, and publicity careers. Degree-seekers study how to promote brands and change campaigns and plans as technology evolves. These online communication master's degrees require 36 credits in asynchronous courses. Core classes for all degrees include media communications and media and culture. Other core courses and electives vary by program, but often address research, organization, and international communications. Webster students can also pursue graduate certificates in digital marketing management and project management through the School of Business and Technology. Related undergraduate certificates include website development, data analytics, and professional writing. The institution boasts international campuses which provide study abroad opportunities in places such as Austria, China, Switzerland, and Thailand. Webster also maintains partnerships and offers faculty-led study abroad programs so that students can learn in countries such as Belgium, Germany, Italy, Japan, Mexico, Norway, Spain, and Ireland. Online learners can access videos, journals, and eBooks through the library's website. Webster's Career Planning and Development Center allows candidates to obtain resume feedback, explore interview tips, and use the school's Handshake account to search for careers. Students can also obtain emergency loans. Webster University is accredited by the Higher Learning Commission. WVU was founded in 1867, and as of Fall 2018, the public Morgantown school had educated more than 29,000 learners. WVU boasts alumni from over 130 countries. The Eberly College of Arts and Sciences delivers a master's in communication studies, which works to help professionals advance in their careers. The program addresses communication strategies that relate to various technologies, group settings, and organizational goals. The curriculum includes courses such as communication in the organization, communication campaigns, theory in professional life, case studies in organizational communication, and social and digital media management. Students complete 36 credits for this online master's in communication over the course of six semesters. Graduates may earn positions in education, public relations, and freelance writing. Candidates can also complete a graduate certificate in integrated marketing communications, which requires 15 credits in place of an integrated marketing communications master's online. Online learners can explore eJournals and databases through the library's website, including resources in communication studies. The library offers a live chat option where distance learners can obtain one-on-one assistance from librarians. Degree-seekers can also find opportunities to participate in community services through WVU's iServe tool. WVU educates nearly 5,000 student parents and offers assistive services, including a family event calendar and childcare through the Child Learning Center. The institution provides study abroad opportunities. Specifically, learners can pursue summer international internships to Australia, Canada, Ireland, Japan, New Zealand, and Spain. Degree-seekers can also participate in semester exchange programs to learn in areas such as Morocco, Israel, Taiwan, France, Italy, Greece, and Romania. WVU holds accreditation from the Higher Learning Commission. Beginning as the Colorado Agricultural College in 1870, CSU educates more than 27,000 learners and prioritizes research. In fact, CSU's research in areas such as clean energy and illness earns around $300 million each year in funding, and approximately 30% of the state's STEM learners choose CSU. To date, this public institution has conferred over 230,000 degrees. The Department of Journalism and Media Communication offers a master of communications and media management that targets field professionals. The program explores digital media options for promoting company goals and brands, along with conventional platforms. Students also examine techniques for communicating for each social media channel and steps for creating communication plans. This degree requires 30 credits in courses such as technologies of public communication, strategic digital communication, and digital media writing and production. Learners complete these courses in groups, or cohorts, but they may choose online electives, such as history of media, digital video editing, and organizational photography. Students interested in fully online communication master's programs, however, should not choose this degree, since the hybrid format mandates attendance at the Denver Learning Center. Degree-seekers can complete this program in two years, or six semesters. Graduates can pursue careers in education, healthcare, entertainment, and corporate organizations as producers, social media managers, and communication managers. Online learners can download a free copy of Microsoft Office, obtain legal guidance from student legal services at no charge, attend free musical events, and benefit from free tutoring from the school's writing center. CSU boasts accreditation from the Higher Learning Commission. UA was founded in 1831 and serves as the state's first public college. In the fall of 2018, this institution in Tuscaloosa educated 38,392 learners, including 53 Goldwater scholars and 15 Rhodes scholars. The school also boasts more than 600 National Merit scholars. UA offers an online master's in communication that helps professionals advance into leadership or management positions; it also helps candidates from other disciplines enter the field. This program focuses on organizational leadership. Students examine the importance of communication in organizations and learn strategies to build productive environments. Coursework also guides learners on persuasive communication and communication theories. Degree-seekers complete 30 credits in courses such as group leadership, human communication theory, relational communication, and conflict and negotiation. The program concludes with a capstone portfolio, professional project, comprehensive examination, or an approved elective. Learners who complete two classes each term can graduate in under two years, afterwards completing an interdisciplinary communications doctorate. UA accepts students on a rolling basis through the year. However, learners should apply by priority deadlines, since admission after these dates depends on program space. Applicants need three references, standardized test scores, and a statement of purpose. University students can access free or low-cost software, including Jabber, EndNote, Microsoft Office 365 Education, and ZoomText. Distance learners can also gain career assistance through virtual career fairs, online mock interviews, and a PDF career guide. UA holds accreditation from Southern Association of Colleges and Schools Commission on Colleges. East Carolina Teaching School started in 1907 with an all-woman student body. In 1943, men began enrolling at the institution, and the school's name changed to East Carolina University in 1967. ECU now educates more than 28,000 learners from 44 nations. This public school in Greenville, North Carolina provides an online master's in communication. This degree focuses on healthcare communication, including in-person dialogue and virtual delivery, to prepare learners for related positions and doctorate programs. The degree requires 30 credits, with core classes including communication theory, research methods, and introduction to health communication. Students may choose from elective offerings in interpersonal health communication, communication approaches to health advocacy, and media and health communication. Degree completion involves submitting a thesis or passing a comprehensive exam. The department connects learners to internships that relate to their career goals. Alumni have completed internships at Sirius/XM Radio, America's Most Wanted, the San Francisco 49ers, and CNN. The College of Fine Arts and Communications offers multiple scholarships. For instance, graduate students can earn the study abroad scholarship. Alumni also benefit from discount membership rates for CommCrew, which offers ongoing networking opportunities. Learners can also pursue a graduate certificate in health communication. The institution's Speech Communication Center gives students in-person and virtual assistance. Specifically, distance learners can participate in consultations through Skype for guidance on giving presentations. ECU is accredited by Southern Association of Colleges and Schools Commission on Colleges. Syracuse University in New York was founded in 1870. More than 22,000 students from 126 nations attended this private institution in the fall of 2017. Syracuse boasts more than 250,000 alumni, ranking as the 53rd best national university, according to U.S. News & World Report. The institution's S.I. Newhouse School of Public Communications began in 1934 and currently offers an online master's in communication. This program teaches professionals in-depth concepts of digital communication and media. Students choose from three specializations: advertising, public relations, or journalism innovation. Each specialization requires 33 credits — with nine directed toward the concentration — and a capstone project. For this project, learners provide a plan to tend to an issue in their concentration. Online learners take synchronous courses, which include video conferencing. The department caps class sizes at 15 students to improve networking among classmates and teachers. Degree candidates must complete two immersion experiences, each lasting one week. The university recommends fulfilling the first immersion on campus, but degree-seekers can complete at least one experience internationally. Of program graduates, 63% gain employment within three months of graduation. These alumni also enter the Newhouse Network. This group includes 26,000 members and provides connections with field professionals. This opportunity matters since 45% of Newhouse alumni credit networking for earning employment. Companies such as ESPN, Google, Pandora, and the Coca-Cola Company hire Newhouse alumni for positions as digital media managers, directors of music programming, editors, and marketing directors. Syracuse boasts accreditation through the Middles States Commission on Higher Education. Liberty University was founded in 1971 and began catering to distance learners in 1985. This Christian institution in Lynchburg, Virginia offers more than 600 programs across 17 schools and colleges. More than 400 of these programs surface online. The school educates more than 100,000 students, with online learners benefiting from a 17-to-1 student-to-professor ratio. The School of Communication and Digital Content delivers an online communications master's degree where field professionals build communication skills for leadership or public speaking positions. Candidates learn to craft impactful messages, resolve organizational issues, and expand company reach. Students explore how perspective and culture impact message interpretation and how to use media to accomplish company goals. This program requires 36 credits, including eight-week courses addressing interpersonal communication, conflict analysis, event planning, social media, nonprofit development, and strategic storytelling. The department delivers most elements synchronously, and it also requires a thesis or comprehensive exam. Students can complete this program in 1.5 years to qualify for positions as communication analysts, communication directors, and public relations specialists. Liberty allows transfer students to apply prior credits to up to 50% of their degree requirements. Learners can also pursue graduate certificates in applied communication studies, communication and business administration, communication and human services, and organizational communication. Online students can view health tip videos through the university's video library, and they can get help with assignments from the online writing center. Liberty University holds accreditation from Southern Association of Colleges and Schools Commission on Colleges. TTU opened in 1925 as Texas Technological College, enrolling just 914 learners. The name changed to Texas Tech University in 1969, and as of Fall 2018, 38,209 students attended TTU. The public school in Lubbock, Texas, comprises 12 schools and colleges offering more than 300 degrees. Field professionals can pursue an online master's degree in strategic communication and innovation through the College of Media and Communication. The program equips learners to deal with the worldwide and technological issues facing modern companies. This degree requires 30 credits. Students must complete six core courses addressing research strategies, organizational communication, and media. Learners must also complete three elective classes from options such as advanced social media practice, multimedia storytelling, interpersonal communication, and production of digital media content. Candidates must also complete a final research project. The department delivers coursework asynchronously and allows students to personalize the pace at which they complete the program. Students can also earn a graduate certificate in advanced digital and social media. TTU Worldwide eLearning connects virtual students to library resources, including a live chat option. This service involves a librarian for every academic discipline who can help learners with source location, source analysis, and format questions. Approximately 1,300 TTU students studied abroad in 2018. Study abroad options include learning at TTU's Spain learning center or an affiliated institution. Candidates can also pursue internships and service opportunities in countries such as Australia, Ireland, Chile, England, and New Zealand. TTU holds accreditation from Southern Association of Colleges and Schools Commission on Colleges. Regent University was established in 1978. This Christian school in Virginia Beach ranks among the U.S. News & World Report's top national universities, boasting a student enrollment of 10,480 in the fall of 2018. The institution delivers an online strategic communication master's degree that trains learners to create content to impact audiences from various backgrounds. Students explore modern technology and media channels, along with relevant research, to design effective communication plans. The program addresses public relations, message development, and crisis resolution. Most faculty — 90% — hold the most advanced degree possible for their discipline. Degree seekers complete 33 credits in eight-week courses, such as multiplatform writing, influence through entertainment, and leadership theory and communication. Candidates can also complete a directed project and thesis. Learners must hold a GPA of at least 3.0 through the program. Degree-seekers can graduate in two years, but they may take up to five years to complete all program elements. Graduates may qualify for careers as media directors, communication analysts, public relations specialists, and social media managers. Similar degrees include the master's in journalism, along with the master's in media and arts management and promotion. Regent also offers a certificate in post-doctoral studies in organizational leadership. The School of Communication and the Arts offers financial assistance to students who demonstrate academic promise. Regent also provides students with free on-campus counseling, including marriage counseling and workshops. The school provides distance learners with a lifeline phone number for assistance, and online students can benefit from math and writing tutors through the Center for Student Happiness. Regent University holds accreditation from Southern Association of Colleges and Schools Commission on Colleges. WSU was founded in 1890 and currently educates more than 31,000 students with a 15-to-1 student-to-faculty ratio. This public schools prioritizes research and boasts more than 214,000 alumni. The Edward R. Murrow College of Communication delivers an online master's in strategic communications for professionals and individuals who want to enter the field. Students explore diverse communication topics such as visual software, corporate concepts, social media platforms, public relations, management, and campaign creation that reflects relevant data. Degree-seekers take courses such as ethics for professionals, crisis communication in global contexts, professional multimedia content creation, and consumer behavior and brand development — totalling 30 credits. Learners must also complete a capstone project or portfolio. Online degree seekers can access library resources, including 710,000 eBooks and 115,000 online articles. The library provides resources on specific subjects, including communication materials exploring journalism, newspapers, media, and technology. Candidates can also find resources for APA, MLA, and Chicago citation styles through the site. WSU students can participate in more than 600 study abroad opportunities through internships, student exchanges, and experiences directed by faculty or provided by external organizations. Study abroad locations include Austria, China, France, Ireland, Argentina, Italy, Greece, and Thailand. The Northwest Commission on Colleges and Universities provides accreditation to WSU. CSP's history reaches back to 1893. Located in Minnesota, this private institution boasts a 90% full-time employment rate for graduate-level alumni. Salaries for university graduates typically surpass average U.S. wages by 44%. As of Fall 2016, 81% of transfer students chose to remain at WSU. Learners can pursue an online master's in strategic communication to explore how evolving technologies and engaging cultures impact communication. Candidates also examine how to use data and research to determine effective problem-solving techniques. These courses can help degree-seekers obtain leadership positions in the field and assist candidates who want to transition into communication professions. Students complete 36 credits, including seven-week courses such as digital communication, media strategies, leadership communication, crisis communication, and strategic customer experience. The program also mandates a capstone that involves a presentation. Online learners benefit from tutoring from the Writing Center through the Blackboard learning platform. This process involves submitting papers with notes on problem areas for tutors to review. The Writing Center also connects learners to resources on citation, sentence structure, and the writing process. The Office of Career Development provides students and alumni with access to CSP's Handshake tool to find job opportunities. Students also gain library access to resource databases that address specific subjects, including communication, and can live chat with a librarian. CSP also maintains a blog with information on health tips, human resource occupations, and cultural factors in the workplace. CSP holds accreditation through the Higher Learning Commission. Stefani Drake is a strategy consultant and speaker with over a decade of experience working with the US government, international NGOs, and nonprofits. She is the founder and lead strategist of her company, Drake Strategies, which serves as the public relations firm for Water Mission, an international NGO dedicated to bringing safe water to communities in need. Stefani is currently on the UNDP's Roster of Communication Experts in Subsaharan Africa and was recognized by HoneyBook and Rising Tide Society as one of the 20 On The Rise for her advocacy work. Why did you choose to earn a master's degree in communications? Was this a field that always interested you? I received a bachelor's degree in speech rhetoric and political science and immediately went to work on political campaigns. It soon became apparent that if I wanted to set myself apart and get experience that would translate to any field, I needed to get a master's degree in communications. I went back to school part time while working full time on political campaigns. After earning my degree, I was able to quickly move up and work in the communications department, which led to my first job on Capitol Hill. I was always interested in politics, but, most importantly, I was driven by my desire to create change. That soon translated to the NGO/nonprofit world, where I have been ever since I left politics. Receiving my master's degree in communications has been extremely valuable in making the transition from one industry to another, and I still rely on my education to this day. What are some of the most crucial skills you gained in your studies that apply to your job on a day-to-day basis? Learning organizational communication in grad school was vital. I always say that strong internal communications reflect externally and I have found that to be true in every place that I have worked. Whether learning various styles of writing in grad school, how to increase positive internal communications, [or how to] implement strategies that are tested and true, my degree has played a role in every job I have had. Did you complete an internship or other type of field experience as part of your master's degree? If so, what knowledge/skills did you gain and how did the experience influence your career choice? I went back for my master's degree while I was working full-time; however, I was able to use my education as a bridge to grow in my field. At the time of my education, I was working on a presidential campaign and was mainly focused on the Iowa Straw Poll and other field operational activities. I wanted to work as a press secretary, so I asked to take on part-time communication responsibilities for no additional pay while I worked on completing my degree. That arrangement led me to apply what I was learning directly to my new job and, once I completed my degree, I made the transition full time into the communications field. What was the job search like after completing your degree? Did you feel fully prepared when making the transition from school to the workplace? I was lucky to be able to pioneer Marist College's online program over ten years ago and I'm very grateful for that opportunity because I, like most, would not have been able to go to grad school full time. As a result of working while going to school, I was able to show my employer what I was learning and leverage that into a new role upon completion of my degree. Even to this day I still rely on what I learned in grad school, whether I'm teaching at a conference, working with clients, or developing a strategic communications plan; the transition was natural and has benefited me everywhere I go. Out of working for the government, working for nonprofits, and consulting, which do you prefer and why? I love the ability to consult because it allows me to take on projects that inspire me. It wasn't something that I had planned to do as I have always enjoyed working on a team; however, having young children, I needed flexibility in my work schedule and consulting has allowed me that freedom. The experience of working for the government was second to none. You are surrounded by brilliant people on a daily basis and I learned so much from those opportunities. The nonprofit field was inspiring and gave me a breadth of new experiences internationally, and consulting ties all that collective experience together and allows me to partner with other organizations and create a larger impact for them. Why did you decide to found your own company? I'm a mom of toddler twins so, while I didn't aspire to be an entrepreneur, it was the right decision for my family and has allowed me to be more creative in my strategies, travel when needed, and take on projects that inspire me. Formalizing my work into Drake Strategies has allowed me to appreciate the experiences I have had and truly focus on those areas where I'm most fluent. What advice would you give to students who are considering a graduate degree in communications? If communication and storytelling inspire you, then go for it. Be humble, learn as much as you can, and collaborate with all of your classmates. You never know where someone will end up and how that relationship can strengthen your work one day. If you're not sure communications is the field for you -- take a free class or two online before making the commitment. But if you are motivated by the idea of sharing stories and inspiring others to take action, then this is the degree for you. A master's in strategic communication from one school may look very different from a graduate communication degree from another school. The curricula and program lengths vary depending on several factors. Degree candidates can specialize in areas such as conflict resolution, advertising, or political communication. Read on for a list of common courses for those seeking an online master's degree in communications. Students learn about important court cases in the history of communications law, how the decisions affect modern media professionals, and observing ongoing trends in the field. Learners also discuss theories surrounding intellectual property rights, copyright, and plagiarism. Some professors dive into international communications law. Public relations, marketing, and advertising professionals rely heavily on research. These courses teach degree candidates to design studies that give insight into consumer habits. Students discover how to analyze data based on their research and make communications decisions accordingly. Critical thinking skills also help graduates use existing research for their brands. In these courses, degree candidates learn how to use their communications strategies to influence the audience's behavior. The class blends psychological and communications theories. Learners leave this class with skills that can help them in areas like political campaigns, advertising, marketing, public service announcements, and public relations. These courses cover the ways that communications can effectively use technological innovations like social media, smartphones, and virtual reality to meet their goals. Educators demonstrate how these tools change media theory and practice. In the digital world, brands cannot afford to waste time with bad communications strategies in a crisis. These courses teach students to put public relations programs in place that safeguard companies if a negative story goes viral. Learners understand how to efficiently contact all involved parties and get in front of the story. How Long Does It Take to Get an Online Master's in Communication? A learner may take between 15 months and five years to complete a communication graduate program. Students who take full-time classes finish quickly, while those who add extra concentrations or certifications should expect to spend a little longer in programs than their peers. Half-time students spend about three years working toward their master's in communication management, and workers who must limit their course load may need four years. In addition to enrollment levels, the school's class schedules can affect how long learners spend on programs. For example, some accelerated programs feature eight-week classes that allow full-time students to graduate in just over one year. Master's in strategic communication programs with traditional terms in the fall, spring, and summer often require more time. The number of transfer credits a school accepts and a student can change the timeline, and learners with bachelor's degrees in unrelated fields sometimes may enroll in foundational communications courses, which can delay graduation. Schools with institutional accreditation offer assurance for both students and their potential employers. The rigorous examinations that these universities and colleges undergo to earn their credentials assure learners of their education's quality. Employers can also understand that the candidates will possess the skills they need to succeed. Institutions receive accreditation both regionally and nationally, but most with national credentials are for-profit and may carry less prestige than provincial counterparts. Attending a school without either type of institutional credential can hurt a student's chances of receiving financial aid. Many scholarships, grants, and tuition reimbursement programs require learners to enroll in accredited programs. Some also require the degree to achieve programmatic accreditation. These credentials apply only to a specific plan within a school. The Accrediting Council on Education in Journalism and Mass Communications (ACEJMC) is the primary agency that oversees communication programs. The U.S. Department of Education (ED) regulates all higher education accreditation in the United States. The department contracts with the Council for Higher Education Accreditation (CHEA), which is a nongovernmental association. CHEA certifies accrediting organizations, including programmatic accreditors like ACEJMC and those that grant institutional credentials. CHEA also allows learners to search all accredited schools. While accreditation can be complicated, students must take it seriously. Credits from unaccredited schools do not assure educational value, often do not transfer, and can keep learners from earning financial aid. PayScale reports that graduates from master's in strategic communication programs earn an average of $63,000 per year. The pay for master's in communication jobs can vary based on many factors, such as location, the type of employer, and the level of responsibility. A candidate's amount of experience often proves itself as the most significant factor in earning power. For example, marketing managers who are just getting started tend to receive about $54,000 annually, but with five or more years of experience, these professionals make $67,000 each year. Earning a master's in strategic communication or a related subject provides graduates with several career options. Depending on the person's personality and interests, in addition to their concentration in graduate school and professional experience, candidates can pursue management positions in marketing, advertising, public relations, or corporate communications. Professionals who do well with numbers and research may pursue market research positions, while learners with more specific interests may enter certain industries, such as healthcare. These professionals oversee the related departments and design programs to increase brand awareness. They may manage teams of writers, designers, and account managers. While some employers only require these managers to have bachelor's degrees, graduate-level courses give learners the skills they need to excel in these positions. Public relations managers represent corporations, nonprofits, government agencies, and high-profile people to the public. These managers maintain their clients' reputations and try to stop crises as they occur. Clients may appreciate the additional skills and knowledge that a master's in strategic communication affords public relations professionals. These data-driven professionals take in data from market researchers who talk to consumers. Analysts pore over the data and find pieces for marketers to apply. They work with the creative marketing team to design effective campaigns and their work benefits from master's degrees, especially those that concentrate on research. While some of these professionals craft books, many write branded content in the digital space, newsletters, marketing copy, or resumes. Writers also create magazine articles, video scripts, and speeches, with some concentrating on niche, technical topics like information technology. A master's degree can help writers specialize and earn more. Communications professionals who specialize in healthcare can find lucrative, stable, and fulfilling work in the field. These managers work with medical professionals to design effective public health campaigns, manage the organization's reputation, and keep all communications in line with confidentiality laws. Master's degrees with health concentrations can help professionals secure these jobs. Professional organizations can serve as valuable resources for online master's in communication students, as well as recent graduates. Perks of membership with a professional organization include access to academic journals and trade publications, professional development and training opportunities, invitations to conferences and networking events, and career counseling and job leads. We outline four of the most prominent professional organizations for those with a communications master's degree below. The PRSA officially launched in 1947 and expanded to represent more than 22,000 employers working in public relations and media communication. Professional development opportunities include certification programs, workshops, webinars, and face-to-face training modules through PRSA chapters. The organization's website also features an aggregation tool, which allows users to browse training options by field and location. The NHRA has assisted HR professionals with training and career advancement since its founding in 1951. Member benefits include networking events with NHRA members and HR professionals, skill-building professional development courses, and the opportunity to serve on local or national committees. The AMA offers training and development in several key areas, such as branding, consumer engagement, digital media, and metrics-based marketing. The association, also home to a total of seven industry magazines and online journals, offers professional marketer certification programs in digital marketing and marketing management. For most students, an online master's in communications degree represents a significant financial investment. Many mitigate the high cost of education by applying for financial aid. The ED offers loans and grants for graduate students, which may be need- or merit-based. To qualify for federal aid, students must complete and submit a Free Application for Federal Student Aid (FAFSA) form. Other sources of financial aid include the student's college or university, public companies, nonprofit organizations, and religious groups.